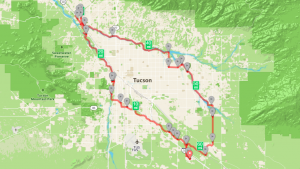 Just finished my last ride for this winter in Tucson. Total miles ridden this winter approximately 3250, 2350 miles since Jan 1. Includes 22 weeks achieving 100+ miles. It has been a great winter of riding in one of the great bicycling cities in the country, with some of the greatest riding friends I have known. Now it is off to Bay View in hopes of continuing the run through the summer. This heatmap , created by STRAVA shows the extent of our riding this winter. 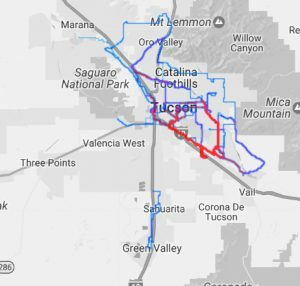 One of the defining features of Tucson Bicycling is The Loop, a multi-use paved path that encompasses the metro area. This map shows a 63 mile portion of the 100+ improved miles of path and parks surrounding the metro area.